The country’s masterplan includes the installation of floating solar panels in eight hydropower plants nationwide with a total capacity of 1,000 megawatts (MW) over the next two decades. The success of the initial five dam-five province project will serve as a benchmark for future endeavours. EGAT will start with the installation of a 45 MW system at the Sirindhorn dam in Ubon Ratchathani province at a cost of US$1 million per MW, with commercial operations beginning next year. 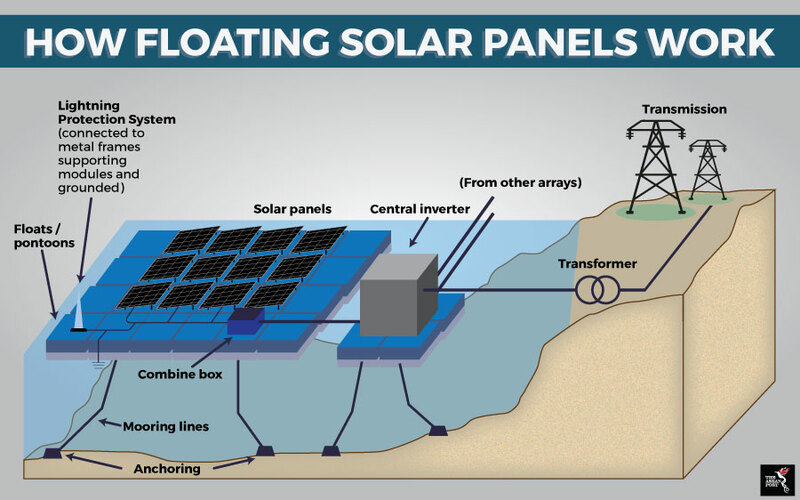 Floating solar is an emerging technology where solar panels are mounted on floating structures and placed on natural or man-made water bodies. The electricity generated is then transmitted to electrical equipment on shore via underwater cables. Existing transmission systems in hydropower facilities can be utilised to store and distribute the electricity generated from the floating solar arrays. At some large hydropower plants, covering just three to four percent of the reservoir with floating solar could double the capacity of the plant. Combining hydropower and solar power outputs can help manage periods of low water availability by using solar capacity first and drawing on hydropower at night or during peak demand, according to a market report on floating solar produced by the World Bank Group and the Solar Energy Research Institute of Singapore (SERIS) last October. Titled Where Sun Meets Water: Floating Solar Market Report, the study noted that in reservoirs, floating solar panels can drastically reduce evaporation by limiting air circulation and intercepting sunlight before it hits the water’s surface. The reduction of sunlight also helps prevent algae blooms, which pollute water and raises treatment costs. The technology is making inroads in land-starved Singapore and archipelagos like Indonesia and the Philippines, which have vast coastlines and numerous inland bodies of water. Apart from Thailand, there is also interest in the technology from other countries which have invested heavily in hydropower such as Lao PDR which operates 46 hydropower stations. While floating solar panels cost more to install compared to ground-mounted systems, they are a better long-term investment as they are up to 16 percent more efficient as the cooling effect of the water helps reduce thermal losses and extends their lifespan. Apart from saving land for agricultural or other uses, floating solar arrays can also convert underutilised bodies of water such as ponds or lakes into revenue-generating operations. A study by United States (US)-based market research and consulting company Grand View Research in 2017 found that the market for global floating solar panels was estimated to be worth US$13.8 million in 2015 and is expected to grow exponentially to US$2.7 billion by 2025 due to rising demand for renewable energy. Sunseap Group, Southeast Asia’s leading sustainable energy provider, is developing one of the world’s largest floating solar arrays along the Straits of Johor in Singapore. According to the Sunseap Group’s website, the system which is roughly the size of five football fields will generate enough renewable energy annually to power about 1,250 four-room flats – with a reduction in greenhouse gas emissions of about 2,600 tonnes every year, over the next 25 years and beyond. At least three firms are piloting floating solar projects in the Philippines. In Vietnam, US clean energy firm Vasari Energy is planning two floating solar projects over the next two years – with each projected to reach a cumulative capacity of between 180-200 MW. Vietnamese hydropower producer Da Mi Hydropower Joint Stock Co. is also planning a 47.5 MW floating solar plant at the reservoir where its Da Mi hydropower plant is located in Binh Thuan province. First announced in 2017, the development of the Cirata floating solar power station in West Java, Indonesia, was postponed to this year due to reviews of the project’s legalities. Masdar – a renewable energy company from the United Arab Emirates who is among the power station’s investors – plans on installing floating solar systems on 60 other reservoirs across Indonesia if the Cirata project is a success. In Lao PDR and Cambodia, studies have shown that building floating solar arrays would be a safer source of renewable energy than dams. The installation of floating solar arrays only started in 2007 with just over 100 projects worldwide according to the US’ National Renewable Energy Laboratory (NREL). Out of these, 73 of the largest projects are in Japan. Hence, it is a relatively new renewable energy source. However, the industry has grown more than a hundred-fold in less than four years. From a worldwide installed capacity of 10 MW at the end of 2014, the number had risen to 1.1 gigawatts (GW) by September 2018, according to the Where Sun Meets Water report. The report estimates the global potential of floating solar, even under conservative assumptions, to be 400 GW – roughly the total capacity of all solar photovoltaic installations worldwide at the end of 2017. “Floating solar technology has huge advantages for countries where land is at a premium or where electricity grids are weak,” said Riccardo Puliti, Senior Director for Energy and Extractives at the World Bank in the Where Sun Meets Water report. “We fully expect demand to grow for this technology and for floating solar to become a larger part of countries’ plans for expanding renewable energy,” he explained.